How to create and delete pages in blog? you are at right place. As a beginner its very difficult to create pages in blog and represent them in different styles. Most of bloggers understands that categories are pages but its wrong, categories and pages are different. Category means group of posts. 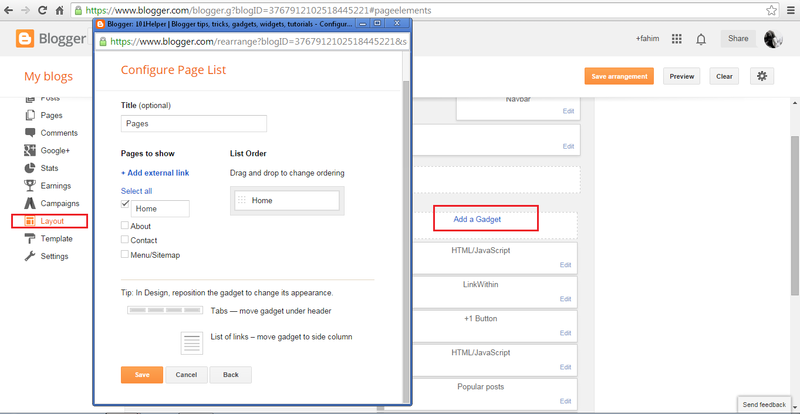 While creating pages is actually relating category to each page for example a default page in blogger is Home which is related with the address of your blog, when it is clicked you are sent to home. Similarly when you create different categories and want to show them as pages like shown in websites you have to relate them with pages. This tutorial is for those who are beginner to blogging and don't know how to create or delete pages. Go to Layout and click add a gadget, a pop-up window will open scroll it down and search for pages. You can see in above image that Home is checked it means that when you click save, a page named Home will be shown as it is checked. Now as I have created some pages like about, contact,menu/sitemap but they aren't check so they will now be shown. 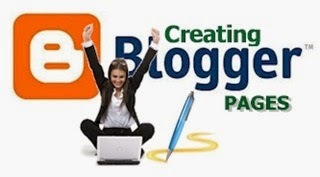 To create a page click on add an external link a box will be shown in which blogger ask for page title and link, so fill the page title and add link of the page for example in Home page external link is your blog address. If external link is not added then when the title is clicked nothing will happen(no redirection to any page). After adding pages and filling titles with external links click save and you are done. Go to Layout and click Edit below gadget and click remove. Click Save arrangement on top-right of the page. Select Template and click on Customize. When you click customize you will reach to customization page, here select Advanced and scroll down to tabs text. In the tabs text option you can customize text of the tabs, select the font family first then if you want bold text click B , if you want italic style click I on the right side of I you can change size of the tabs text. After style its time to customize color you can find two color box number 1 is text color and the second one is Selected color text color refers to active color and select color refers to the color which will display on mouse hover. So customize it in your own way as you like it, for example if you want to show black color of text select black in text color box and if you want to show mouse hover color white then select white in selected color box. This step is about customizing color of tabs, you can change color of both active tabs and color of tabs when hovered by mouse, to customize color of tabs just below the tabs text select tabs background in the Advanced tab of customization page. Here the background color box refers to active tabs(not hovered by mouse) so select the color which you like and the other color box is select color its the color which will show up when a tab is hovered by mouse, select it as you like. 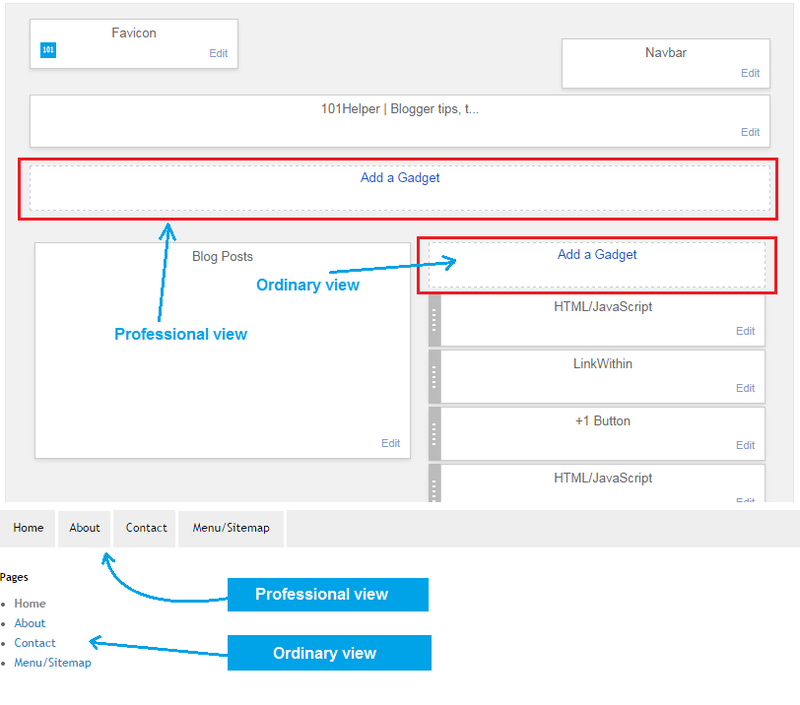 After customization it time to save changes, so on the top right of the page click on apply to blog and you are done. If this post was helpful to you do me a favor recommend this page on Google by clicking [g+1] below or share this post on twitter and Facebook. Follow by E-mail to get latest updates in your inbox.